No matter if you are a seasoned veteran of Final Cut Pro X or if you are just starting out, these keyboard skins are super useful when editing. 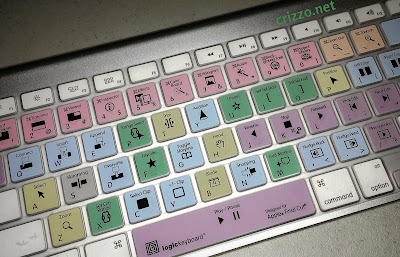 There are so many keyboard shortcuts in FCP X that most of the time I forget that they are even there. Having a visual reminder is super useful as keyboard shortcuts make editing much quicker in my opinion. Between the different applications I use such as FCP X, Motion 5, Photoshop, Lightroom, Logic Pro X, etc., they all utilize keyboard shortcuts and it is hard keeping up with what is what, this skin helps with that. Also, another aspect of the keyboard skin is it feels great to type on. Not sure how to describe it other than it softens the keys and feels better when typing. One thing I would keep in mind as well, I am not sure if the paint will wear off over time, so I most likely will remove it when I am not editing. But, the good thing is that these are cheap enough that even if the paint on the keys does wear-out they are affordable and can be easily replaced. The skins will fit on both the smaller wireless Apple keyboard, the MacBook Air and MacBook Pro keyboards. I am not sure about the new MacBook as I don't own one to test it on.